The webpage has been developed in order to provide you with more detailed information about our swimming pool plan’s equipment Listings. Our swimming pool designs will generally included an equipment schematic that shows the planned intentions for your pool’s operational functionality. This diagram exhibits a numbered correspondence for both the selections in equipment as well as the several interconnecting pipes and conduits that make the pool’s features perform. The item numbers, P-1-1, P-1-2, P-1-3…and so on, indicates the designated PLAN REFERENCES that we use for identifying the equipment and products that are being specified on your Swimming Pool Plans. 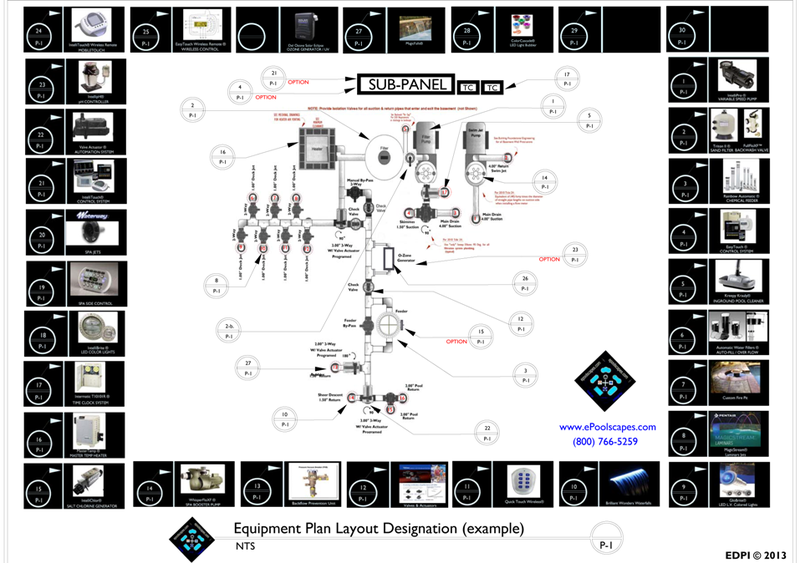 By clicking upon the image you can view an enlarged image of each piece of equipment and read the complete manufacturer definition for each component. Our approach reflects the highest level of commitment for the planning process of your new swimming pool. In providing such explicit information it allows our clients to place a greater value on the importance of planning so that the results from building can truly be anticipated. The costs associated with building a truly well thought-out approach to construction will initially costs a little more but, the long term savings that are gained from better planning will pay you dividends over the life of your swimming pool. If you’d like to know more about these benefits and savings please click HERE to read more!